A last ditch push for a separated on-road bike lane, as well as a separated off-road trail underpass, has been made by Bike Bendigo Inc. This community based group have also supported the Friends of the Bendigo-Kilmore Rail Trail group’s efforts to change VicRoads upgrade plans for Napier St Bendigo. 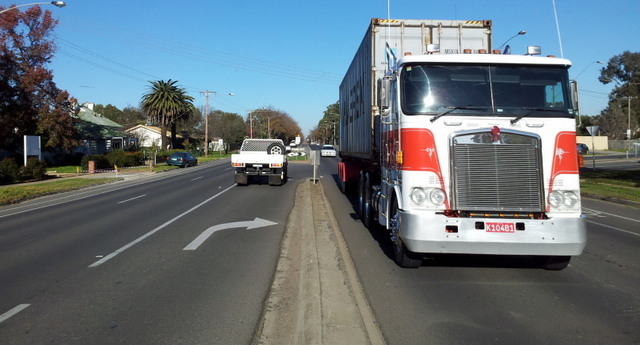 Seeking to incorporate safer infrastructure for cyclists and pedestrians into the $30.4M major arterial road upgrade project, both Bike Bendigo and the Friends group have identified the O’Keefe Rail Trail crossing of Napier St as being a forgotten element compared to the roadway and motor vehicle users. The O’Keefe Rail Trail is expected to be an important future ‘active transport’ link. The City of Greater Bendigo Council’s recent Intergrated Transport and Land Use Strategy report identified active transport as a critical element to improving and managing Bendigo’s future transport network. For this off-road trail’s crossing of Napier St to be increasingly popular for pedestrians, walkers and cyclists, it must be designed and built as being safe to use. A crossing separation, ultilising an underpass of Napier St, is seen as a future proof means of attracting more commutor and recreational use of the trail. Jacinta Allan MP, Victorian State Minister for Public Transport, Minister for Major Projects has been made aware of the short coming of the Napier St project, and has become involved as the Member for Bendigo East. The Federal Member for Bendigo, Lisa Chesters, has thrown her support behind improving the safety of this current hazardous crossing of Napier St by the O’Keefe Rail Trail. The published Bike Bendigo’s community concerns in The Bendigo Advertiser highlights aspects of this VicRoads project that must be reviewed and taken seriously when finalising the Napier St plans. Interest groups and community members are encouraged to contact the Member for East Bendigo Jacinta Allan MP, and VicRoads (Bendigo), to seek the inclusion of a trail underpass into the Napier St project.